This week we are going to explore two concepts, 'Diversification' and 'Asset Allocation' which can have significant impact on investment success over the long term, and which are shrouded in mystery and often misunderstood. We are going to tell it like it is, share some insights which may surprise you, and give you some food for thought if this applies to you. This is the term most commonly used to refer to the proportional distribution of an investment portfolio between different assets. The asset allocation of a portfolio will determine how much of that investment will be allocated to two or more different asset classes; the most common being Equities, Bonds, Property, Commodities and Cash. The rationale for allocating across asset classes is founded in the alleged correlation in returns between various assets at different points in the cycles of each. The principle here is that if the portion of your portfolio in 'asset A' is in a temporary decline that your portion in 'asset B' will be on the ascent. I say alleged because there is a lot of conflicting evidence as to whether there is a negative correlation or not. Ultimately this concept aims to deliver consistently positive returns while reducing volatility of the overall portfolio. An example of multi-asset allocation is the likes of multi-asset funds which have been hugely popular in recent years, via banks, brokers and advisors. These aim to invest a portion of your funds, say 50% in Equities, 30% in Bonds, 10% in Commodities and 10% Property. The alternative to multiple asset allocation is to have all your portfolio on 1 main asset class. We'll explore some stats in a minute to see how these compare in terms of performance. This is where the misunderstandings often start! While they are often referred to in the same light Diversification and Asset-Allocation are different in that diversification refers to the degree of variety that a portfolio might hold within the asset classes it invests in. So, for example I could invest in a portfolio that invests in multiple assets yet has minimal diversification. Taking the above asset-allocation example and with a pot of €200,000, a vastly under-diversified portfolio might contain €100,000 worth of stock of a single company, €60,000 of Corporate Bond from 1 company, €20,000 of silver, and €20,000 share of a single building. It has diversity in terms of asset allocation but it is NOT really diversified! Anything happens to the shares of that 1 company and 50% of my portfolio is gone. Anything happens the issuers of the Bond and again we're in irreparable loss territory, and so on and so forth! Speaking of loss I was reading parts of the Edelman Trust Barometer, which is a global research which assesses levels of trust we have, right across the globe, with our employers, employees, and with all the various commercial sectors. Really sad to say that Financial Services ranked again at the bottom of the pile in regards the levels of trust that people have, below Consumer Packaged Goods, Fashion, Pharmaceuticals, Automotive etc etc. Surely transparency and truth and full disclosure are the way. Though that will not happen overnight it has to happen one truth, one advisor, one firm, one corporation and one regulator at at a time. Anyway, back on the subject, diversification is broadly felt to be a very worthwhile thing, whether than is within different classes or not, holding one of anything is an invitation to have that one thing permanently disappear, and that is nothing that any of us can recover from. I shared a personal story about this in Blog 73 or Podcast 88. Not that anyone would be remotely interested but I now use that cheque as a book-mark in any financial/investment book I read (I'm always reading at least one - so it keeps this in the importance of diversification at the forefront of my mind). The randomness of returns across asset classes, and indeed within them prompt people to diversify. Nobody can know if, for example, Small Cap Equities will go better than Emerging Markets, or indeed Large Cap Equities over any given future period, and so the lack of ability to predict the future (nobody can - so ignore anyone that tells you otherwise) leads investors and fund managers to adopt an approach of 'a bit of everything' in the hope that it will deliver the best balance of decent returns and reduced volatility. By way of example, there was a piece of research that was put out by Ben Carlson of the 'A wealth of common sense' in the US which showed the extreme variety of returns from various assets over the past 11 years. He tracked Small Cap Equities, Mid-size Equities, Large Cap US Equities, Global Equities, Emerging Markets (all of which are of the asset class most commonly known as Equities!) Bonds, Cash, Real Estate Investment Trusts (REITs, or Property) and Commodities. So we can see that it is 3 forms of Equities that are the top 3 performers in this particular piece of research, with property, bonds, cash and commodities bringing up the rear. If you were investing over that 11 year period would you have preferred to own equities or would you have preferred to own a blend of all assets.....?? 11 years may not be long enough a period on which to base a decision, or perhaps it is!? What is even more interesting about all this is that during the 11 years various asset classes performed at varying degrees, with some appearing in the upper quartile most years, and others not doing so well! For instance, Commodities were dreadful pretty-much every year, with Emerging Market Equities also consistently ranked in the bottom quartile of assets. As an investor one would have to ask why would we want to own such things!? Yes there is an argument to suggest that they may smooth the volatility, but if returns had been your goal over that period they simply did not do anything to help, indeed their very presence reduced the gains that you could have achieved. Yes we know that anything could happen in the future and that the variation of returns could possibly (but not probably!) swing, however if we are talking about aiming to achieve optimum returns do you put your faith in the asset class that has delivered what you seek, or the ones that haven't!? Have Multi-Asset-Allocation Worked In Ireland? Following the example of above I decided to test the theory in facts and figures. 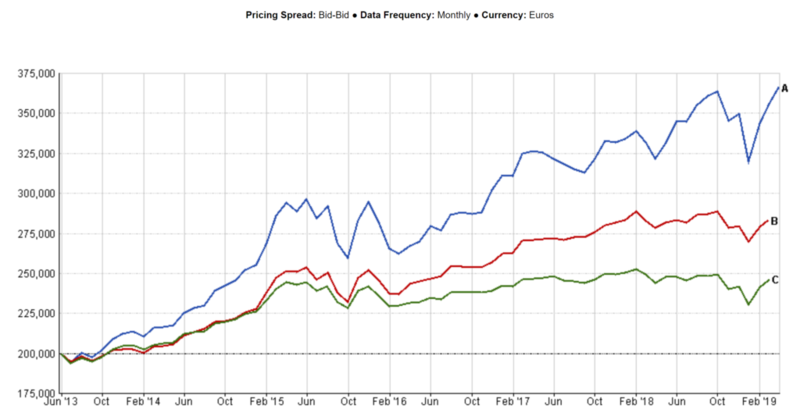 Using a fund analysis software which allows all sorts of really interesting research I have compared 2 really popular multi-asset funds from 2 different providers, with a simple global equity index fund. Now some might say that a simple global equity index is not diversified, however I will point out that the one in question follows the fortunes of over 1600 different companies from all over the globe, and even the top 10 largest holdings of the fund in total amount to 11%, the other 1590 companies making up the remaining 90%. These 1600 companies are involved in a diverse range of sectors; such as consumer goods, technology, finance, utlities, healthcare, energy etc etc. It is not diversified in terms of various sectors of equity strategy such as Emerging Markets, Small Cap, Mid Cap etc, but this is just an illustration, we'll save the real nitty-gritty for another week! Oh, the multi-asset fund data goes back to 2013 when it was launched, while the simple index has data going back to the 90's, so we can only really compare activity since 2013. The multi-asset funds in question are made up of approx 60% Equity, 20% Commodity, 10% Property and 10% Bonds, while the equity index was obviously 100% global equity. The impact from a volatility perspective is that the multi-asset funds show volatility ratings of 5 and 5.5 while the equity index has volatility rating of 10, so almost twice as volatile (which is not the same as risk - risk is the chance of permanent loss of capital - which has yet to actually happen a well diversified index, as far as I or anyone I study is aware). Below you will see how an investment of €200,000 has performed in each of the 3 investments from then until March 19. In gross terms one of the multi-assets is now worth €245,000 and the other is €283,000. Out in front is the equity index, valued at €366,000. In reality most of us would be pretty pleased with most of these as an outcome, they are up in value by 23%, 41% and 83% respectively. Couple of observations from this; a) it's clear even from this really short and sweet analysis that some multi-asset funds have delivered really really poor returns while some have done quite well. b) the volatility of the pure equity fund is approx double that of the multi-assets, and have on average delivered at least double the returns! This is the sole argument FOR having broad asset allocation really, that in times of temporary decline the decline of a portfolio which has multiple assets SHOULD in theory be less than the declines of an equity fund. So let's test it! We analysed how these same 3 funds performed if you had invested €200,000 and then been met with a period of temporary declines. Please note I call them temporary declines for the simple reason that every single decline in equity markets over the past 120 odd-years of their chartered existence has been temporary, they have always recovered to continue their constant upward curve. So what happens? Well we analysed what happened your €200,000 when you invested it in late September 2018. If you watch these things (and you read this blog!) you will know that equity markets had a temporary decline from then until Christmas Eve. If you were invested in the multi-asset funds you would have experienced a temporary decline in value to the tune of 6.5%-7.5% as of Christmas Eve while if you were in the equity index you'd have seen a temporary decline in your value of 12%, as you would expect, based on the above analysis. What happened immediately after that? Well equity markets have recovered (as they have done immediately following every one of the hundreds of temporary declines in history) and gone beyond the point at which they were before the temporary decline. Your investment in pure equity fund has surpassed the point at which we invested and already outstripped the multi-asset values. That is a really narrow window of analysis I know but it is also quite interesting to see the behaviour of portfolios with broad asset allocation versus one which is invested in the asset which historically has delivered the optimum long term returns for patient investors. If you are the sort that would be terrified seeing your values decline by 12% then, as I have previously written, you had best stay clear of such investments, particularly given that the ANNUAL average temporary declines of the S&P500 at least is a fraction under 14%. If you cannot bear that thought then you will definitely not be able to cope when you hear that it declines by an average of 35%, statistically 1 in every 5 years! I'm not making a case for or against asset allocation, not for a second, but I am saying that if an investor was aiming to achieve the best outcome for their investments, and they were capable of withstanding the levels of volatility there is absolutely no question that an asset-allocation of 100% in well diversified equities would have delivered, based on these parameters at least, a significantly better outcome for the long term investor. And speaking of which, if you think you are not a long term investor but instead are more of a short term investor I'm afraid you are courageously wrong, you're a speculator!